If you are providing quotes for media (CD-ROM or DVD) replication with options such as printing and shipping, use this form. This form is meant for simple replication quotes. time, we were up and running, enjoying consistent, professional estimates, contracts and correspondence - all from one easily maintainable package." This Replication Quote Order Form is included in editable Word format that can be customized in Word or by using the included Wizard software. How do you write a Replication Quote Order Form document? This quote is good for 30 days from the date listed below. Insert what you are doing for the customer here. Fed Ex UPS DHL USPS Freight. Estimated Shipping Costs: Insert Shipping Estimate. Note: All shipping costs are estimates and subject to change. Customers may opt to use their shipper of choice or their own account. 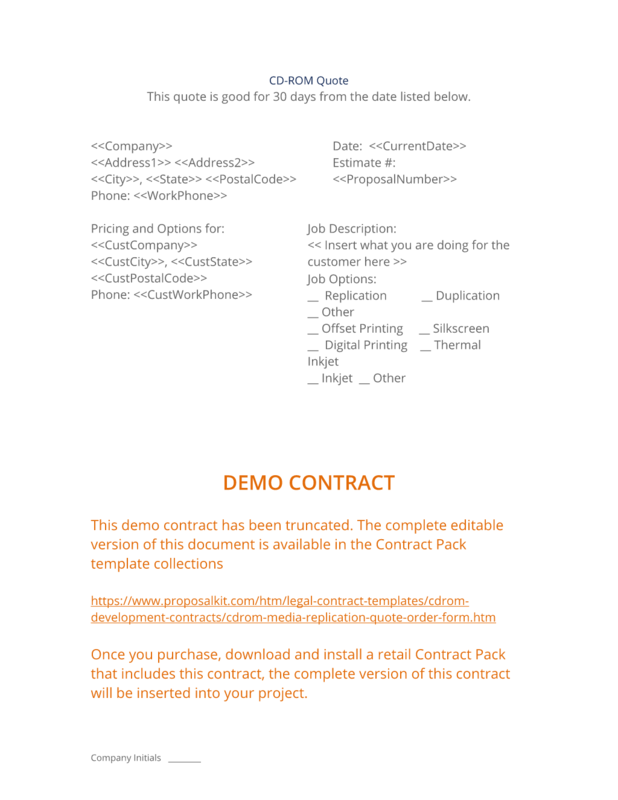 The complete Replication Quote Order Form - with the actual formatting and layout - is available in this Contract Pack.